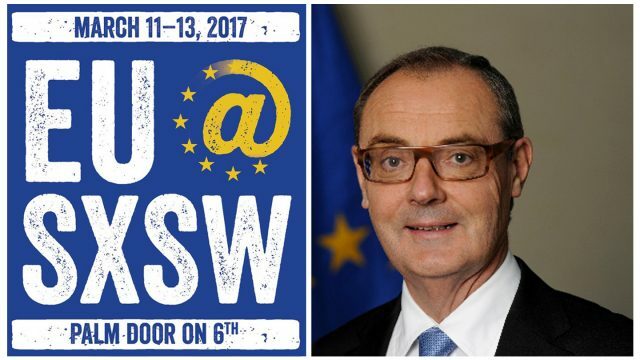 The EU Ambassador to the U.S., David O’Sullivan, is very excited to be part of EU@SXSW, the European Union’s inaugural presence at SXSW. O’Sullivan is looking forward to engaging actively with the many creators, innovators, and entrepreneurs coming to Austin from the EU and around the world for this fusion of the creative and digital sectors. Tomorrow night, O’Sullivan will be kicking off EU@SXSW at the Palm Door on 6th (508 East 6th St) with European startups, speakers, and U.S. partners. Make sure to join this event to to meet the startups, catch a short film from Europe, and enjoy a live performance by Irish musician Johnny Holder. Then on Sunday March 12 and Monday March 13, EU@SXSW will have a full lineup of programming. On the digital side, EU and U.S. experts will discuss topics including values driving digital policymaking, and how the ‘Internet of Things’ creates new cybersecurity challenges, while EU startups will demonstrate their products outside on the deck. On the cultural side, there will be a panel that asks how cinema can be an agent for social change and how cities can harness creative minds to solve local challenges. Prefer film? Join us for the 2016 LUX Prize-winning Toni Erdmann, Dutch documentary The European, or short films on happiness courtesy of EuroChannel. A few other highlights include a Nordic evening on the 12th, and our lively Grand Finale with a Portuguese folk-punk band on March 13. Plan your visit at euintheus.org/sxsw, and follow the excitement with #EUatSXSW. Let the countdown begin! Content provided by David O’Sullivan, EU Ambassador to the U.S.